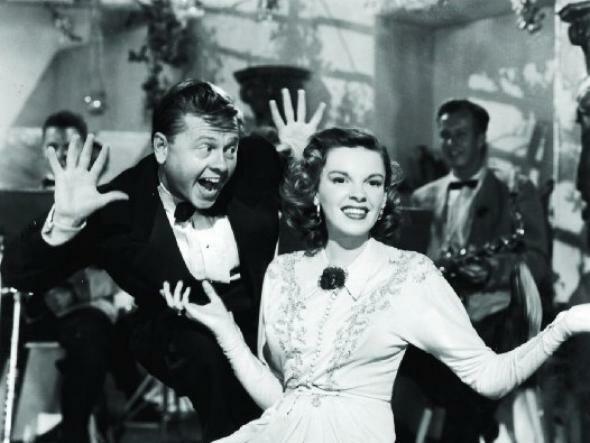 Mickey Rooney and Judy Garland perform in Words and Music. Mickey Rooney, one of the last surviving stars from the silent film era, has died at the age of 93. Rooney’s career, one of the longest in film history, spanned nearly his entire life: After starting out as a vaudeville performer as a toddler alongside his parents, his first short film, Not to Be Trusted, came along in 1926, and IMDb lists him as having a role in a new adaptation of Dr. Jekyll and Mr. Hyde, which is currently filming. The always-enthusiastic performer created many memorable roles and moments onscreen (some more difficult to watch nowadays than others), but he was perhaps never more endearing than when he was putting on a show. To remember the actor, here are a few of his best onscreen musical numbers. Singin’ in the Rain made this song famous, but “Good Morning” was actually first performed onscreen by Rooney and his frequent co-star and friend Judy Garland. Their version, while less theatrical than the former (their characters are auditioning for a music producer), is no less delightful and the playful interactions between the two stars showcase a wonderful chemistry. As stated in his New York Times obituary, Rooney could do it all: “act, sing, dance, play piano and drums, and before he was out of short pants he could cry on cue.” This scene, which showcases his impressive drumming skills, is a perfect example of his many talents, as well as the exuberance he brought to every performance. Rooney’s physical comedy skills are in peak form in his performance of this classic Gershwin tune. The short-statured actor is tossed around like a rag doll by a line of women significantly taller than him, and he seems to enjoy every minute of it—and so do we. If you can overlook some of the regrettable liberties it took in its portrayal of songwriting duo Rodgers and Hart (Rooney plays Hart), Words and Music includes several memorable musical numbers from Hollywood performers appearing as themselves. This number, which reunites Rooney with Garland for the last time in a feature film, gives the stars another great song to lend their talents to, and is yet more proof of their undeniable chemistry. The latter half of Rooney’s career was nearly just as prolific as the former, and his performance as Lampie in this underappreciated Disney live-action film was one of his best. Alongside co-stars Helen Reddy and young Sean Marshall, Rooney sings and dances happily around a lighthouse—even as he entered his later years, he still had the youthful energy of a sprightly, delightful kid.